According to some sources, spring has appeared in some parts of the Northern hemisphere. Apparently it missed Chicago, but as it’s April, a little illusion on the plate wouldn’t hurt, so I thought of tabbouleh. This Lebanese fresh herb salad is my cheering-up-the-gray-days staple and a good excuse to chop away my winter sorrows. The very sight of bunches of mint, parsley, dill and cilantro (coriander) on the kitchen counter makes me smile. The green color and fresh aroma help me forget the snow, the cold and the wind and the bite of the bulgur wheat shakes off the lethargy as does the lemon juice that it has soaked in. The combination of the fresh greens with chopped tomatoes, cucumber, red onion and crunchy bulgur wheat is addictive. I use fine cracked bulgur from my favorite Middle Eastern store, Alkhyam Bakery at 4744-46 N. Kedzie Ave, corner of Lawrence. Before using always go through the wheat and throw out any dark grains. For the tabbouleh, you never soak it in hot water, but in a mix of lemon juice and cold water – it should keep a crunchy bite – and besides, it will soak up the juices of the salad. You can make tabbouleh for two or twenty two, but it has to be eaten the very same day. If you leave it to soak for too long you’ll lose the crunchiness of the wheat and freshness of the herbs. The best way to serve it is spooned on Romaine lettuce leaves – you roll it and eat with your hands. Another rule is to keep the proportions right – forget the versions with cous-cous or so much bulgur that the dominant color is yellow. It has to be green, with little specks of wheat and red tomatoes and a strong lemony taste. Use the smallest and crunchiest cucumbers you can lay your hands on. Surprisingly for me this was the hardest ingredient to find here. Usually it was the fresh mint, but in Chicago cucumbers smaller than a baseball bat are the really tough to find. The best so far are the ones called Persian or mini. They cost a fortune, so sometimes I give up and go for the smallest and hardest monster I can get. Place the bulgur in a bowl, pour half of the lemon juice and enough cold water over it to moisten it thoroughly and let soak for 15 minutes. In a big bowl combine all the greens and vegetables. Sprinkle with salt and pepper, add the rest of the lemon juice and mix well. Squeeze all the water from the bulgur and add to the bowl. Mix once more and adjust the seasoning. The Lebanese will stop right there and serve the salad, but I like to add olive oil. Combine the salad ingredients no longer than 30 minutes before serving to avoid the bulgur getting too soft – it will keep absorbing the juices in the bowl. 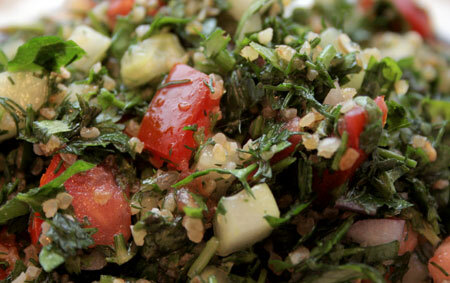 Tabbouleh is great as part of a mezze plater or with roasted meat and fish. It’s my party pleaser and back yard grill staple. Some warm pita will go well with it too. This entry was posted on Friday, April 10th, 2009 at 6:00 am	and is filed under Recipes, Salads. You can follow any responses to this entry through the RSS 2.0 feed. You can leave a response, or trackback from your own site.